I've been a fan of tile for a long time and as the title says for variety, versatility and it's longevity. These are key components in any lasting project that you are going to undertake and as a builder, I am able to see and implement many aspects of a project and one of the materials that is so interesting is tile. There are so many various types and styles to choose from that it can be overwhelming yet with that comes a whole line of possibilities that other materials can't offer. Not to mention that they can used used almost anywhere in a home from floors to walls, baths, countertops and even outside for patios and by the pool. The possibilities are almost endless so let's look at the three topics that I mentioned. The choice of material is really a matter of what you like and the application that you will be using it for but the variety and depth of the products offered is amazing today. 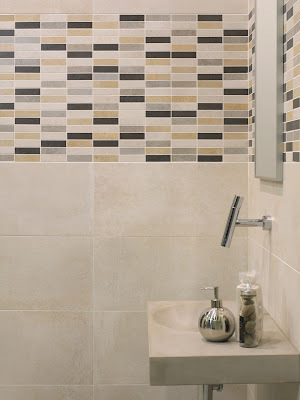 Finding the tile that suits your project, budget, use and style is merely a matter of searching. If you look at all the places that tile can be used in a home from floors to walls to baths and kitchens you may even be tempted to use them everywhere. They can be mixed to form a beautiful look in a bathroom as shown below. They can be used to create stunning walls that you'll admire for years to come as will anyone that sees them. As technology advances materials can be also be mixed creating stunning pieces that mix wood and tile, two products that have never been this closely tied together in the same sentence. This can even be used in a shower installation. Tile can be used in traditional homes and look perfectly at home. Tile can accent and enhance almost any surface into a work of art. Are you seeing how you could make it even better with tile? Tile has a proven longevity. All you have to do is look through history and you can find wonderful examples that have survived for thousands of years. It has been proven to provide a lasting surface as well as remain a beautiful way to enhance almost any surface. What will people in the coming era's say of the tile now? I really don't know but it will still be here and is changing all the time to include new techniques and styles that will be a joy to have and use today as well as for ages to come. The pattern of a cement tile floor adds unmatched beauty and elegance to a room, just like it did over a century ago. Using a cool blue color palette and five colors, this historical pattern creates a sophisticated look that isn't fussy. Keeping with tradition, the patterned field tiles are framed with a border to create a "tile rug" design. The choice of cool colors paired with a bright red accent in the pattern make the formal design very comfortable but still easy to relax in. 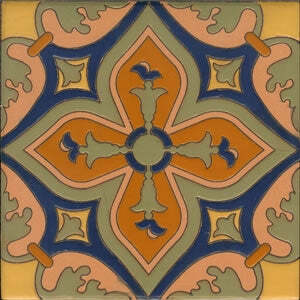 The Roseton pattern, from our Mission Cement Tile line, comes in two standard colorways: Roseton A and Roseton B. The Roseton B in an 8"x8" format is used in this month's project pick. 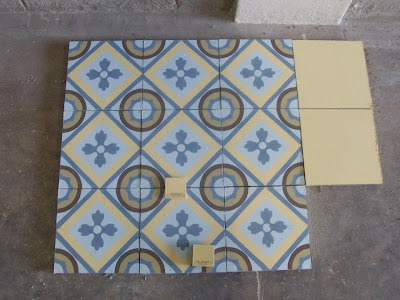 When using an existing cement tile colorway, fill the area outside of the rug with solid colors used in the pattern. Make sure to use only colors from our Mission Solid Color Cement Tiles. You can also change the colors used on this pattern using any of the sixty colors found in the Mission color palette. Decide on one or two patterns you like. Order color chips (cement tile swatches) from the same line as the pattern tiles. Decide on a color palette using two or three colors. Add one neutral color for backgrounds and a contrasting color for accents. Create different virtual designs using your palette. Decide which one you like best. Order strike-off samples. These samples allow you to confirm the design before purchasing an entire order. Join our mailing list to receive our monthly newsletter, Tile Talk, for free. You'll find great design ideas, tile tips, and information about new products. We'll also notify you of special promotions that are only offered to subscribers. Avente Tile welcomes a new perspective to tile on our blog. Guest post provided by Area Floors, providing personal flooring and counter top solutions in Portland, Oregon. Designing a tile mural for your kitchen backsplash can be overwhelming. With so many colors, shapes, sizes and materials to choose from, it's easy to lose sight of the forest for the trees. Yet it's also an opportunity to really let your creative side shine. 1. Choose a relief centerpiece. Relief tiles - those with a raised design - add texture and dimension to your backsplash, creating a mural that pops off the wall. For example, when turned horizontally and finished in bronze, the Cumbria Mural from Sonoma Reserve gives this kitchen an Old World touch. To increase the impact of the mural, the designer added "matting" using 1x1 adobe-colored field tiles. A light-colored border helps the piece transition into the "quilted" field, which softens the effect and helps the relief centerpiece stand out. 2. Set your mural into the wall. Another way to maximize the impact of your kitchen mural is to set it back into the wall, creating a shadowbox effect. Here, a gentle arch over the top provides a nice contrast to the 1x1 square mosaics, while the bottom border adds utility by creating shelf space for spices. The monochromatic framing around the inset - created with hemp-colored glass tiles - helps anchor the centerpiece. 3. Surround your mural with a basket weave. Arched tiles in a broken joint pattern create a basket weave effect that adds texture and interest to the mural. When paired with 2x2 black onyx tiles in a modern design, these white arched tiles create a striking contrast in both color and style, drawing the eye to the center of the mural. 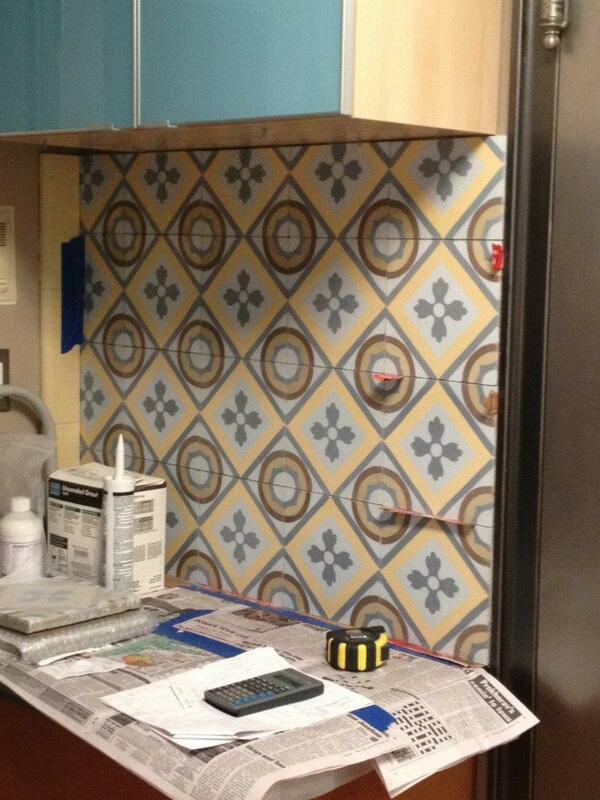 Designing a backsplash mural is about more than just choosing a color palette. With the wide range of artisan tiles available today, there's no end to the stunning combinations you can create. Meet Avente Tile customer Constance Zaytoun. If you follow my blog, you’ll remember photos that Constance so generously shared of the drop-dead gorgeous kitchen remodel in my post, A Cement Tile Kitchen Backsplash Makes a Chelsea Remodel. She and her husband, Marc Weitz, embarked on a journey about a year ago to make their humble Chelsea kitchen into nothing short of stunning! They had a vision, a goal and a budget and they achieved just about everything they wanted with their project. I’ve never met Constance IRL (in real life); but, from the first call I could tell her determination and enthusiasm would make this project a success. We got to know each other quite well over the course of the project which is important when you work as team on custom cement tile project. You have to get to know folks – what they like and what is important - if you want to help them discover the right tile for their job. If you’ve ever done a remodel, I think you’ll agree that at some point you hit a “breaking point.” You are so discouraged that it seems impossible that something else could go wrong and it does. You’re almost ready to “hang in the towel.” You are just certain that all of the forces of the universe are working against you. The thought of washing dishes in the bathroom sink becomes unfathomable. It usually works itself out; but, remodeling is stressful. And to make the challenge even greater, Constance didn't hire a designer, she managed all of the procurement and construction work herself while working and attending school. OK, I’m impressed. I finally caught up with Constance and asked her how she did it and if she’d share her project, design and tile secrets with us! I think you will enjoy Constance's insights and fun approach to life. Tile Talk: You've had a busy spring and your kitchen looks great! How did your actual project schedule compare with the initial schedule? Oh, golly! Initially, folks told us this project would take one month, though Marc and I knew it would take longer. But all our friends told us that a project like this takes double the time and double the money from what you originally plan, and I did not want to believe that. We started our planning last September and October and demolition in the kitchen began the first of November. We're still not completely finished, but our kitchen was functioning (sans dishwasher) by the middle of January and, as you know, the tile was not installed until the second week of April. By Christmas, we were definitely tired of using a hot plate and the bathroom sink to wash dishes! TT: Why did you decide to be both kitchen designer and GC (General Contractor)? TT: What provided the inspiration for your choice of colors and design? Well... this is interesting because the entire project evolved initially from the idea that we wanted to re-paint the living room area which adjoins the kitchen area. Our bedroom has a color that reminds us of a sunset, so we were looking for some form of "sunrise" in the living room. Last summer we had multiple swatches of paint on our plaster wall and for ages we called it our "Rothko wall." Then, once we determined that we could renovate the kitchen, we began to think of which colors in the kitchen would work with the color we chose for our living room (a Portola limewash in Papaya) given their proximity to each other. We have some lovely friends who are artists and designers, so they gave us great input, and then when Jamie from Portola Paints came into the picture, he really helped me design our color palette. I knew I wanted to paint the soffit, which is clearly visible from the living room, some kind of bold blue. But there were two other principles guiding our design choices—I had a mad desire for zinc on the countertops and hand-poured cement tiles on the walls. Also, we did not really have a choice with the design of the base cabinets, as those were the ones Rako needed to work with given our budget and given that he would need to customize the standard cabinets in many places because of the odd measurements of the space. So, with the zinc sample, base cabinet door, and living room paint color swatch, Marc and I took those items and your tile chip set and headed to IKEA (for my first trip ever) to choose the wall cabinets and to determine which tile colors we preferred within the combination. To all of this, I have to add that Marc and I recognize that we have eclectic and somewhat bold tastes in design. We also like to honor the space in which we live, and we live in a pre-war Art Deco building. In our apartment, the front door is in the kitchen, so not only does the kitchen space need to function well (and we love to cook and entertain! ), but it also needs to be inviting and needs to work in combination with the rest of the apartment. Obviously we are not afraid of color. We do have Southern exposure but it is not super-strong as we are in the back of a courtyard with other buildings, so we enjoy inviting brightness in the room. Somehow, we came up with an overall sense of artistic Modern in combination with rustic Mediterranean and pops of Art Deco. Sounds crazy but it works, and I suppose, one of our guiding principles is working with and showcasing artisan materials. I found fabulous vendors to help us to that end—those whom I've already mentioned along with Abby from Gretel Home (pendants and canteen hooks), Jay at Jelinek Cork (mosaic recycled penny cork floor), Marielle at Copperworks (zinc countertops with hand edging), and folks at Bendheim, a wonderful glass factory which we toured in New Jersey (Italian blue etch and Eco Pyramid glass inserts in closet door). 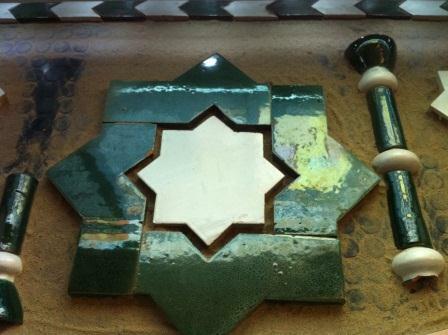 TT: You purchased custom strike-off samples in two cement tile patterns for the backsplash. The total cost of samples was about $150. Do you agree that getting samples is critical to make the right design choices? ABSOLUTELY!! While the chips I chose with you directed me to colors and helped us choose the Rubrik wall cabinet in blue (originally only intended as an accent cabinet for IKEA), I would have never been able to choose the correct tile without the strike-off samples. I knew that our space could not accommodate one of your beautiful Cuban Heritage patterns (which I still absolutely adore! ); we needed something that would repeat without building the pattern across multiple tiles. That said, initially I was leaning toward the pattern of the Ocoa because I just thought it was more interesting than the Romana. But once we saw the 8x8 tiles, our answer was clear and then I was able to build out everything else from that design choice, including the paint for the kitchen, the stain for the hardwood floors, the paint for the open shelves and reconfigured table-turn-cart, and any accent pieces. Also, once I saw those beautiful tiles, I became convinced that I did not want to cut into the tile or interrupt the pattern for electrical outlets. That's when I sought out Dave from Task Lighting to help me design an angled plug-mold for us to install at the edge between the wall cabinets and the tile. Additionally, I want to mention that we ordered two of each style so we could better see the overall pattern. I almost wish we had purchased four of each because it was not until we put the tile up on the wall that we fully realized the prominence of the "circles" in the Romana pattern. Initially we were concerned (would it look like a circus—squares and circles? ), but for some reason, the grout makes all the difference in softening our eye's perception of the pattern. Lastly, I have to say—and I know it cannot be helped—there is a big difference between what we see on the computer screen and what we see with the actual tile. 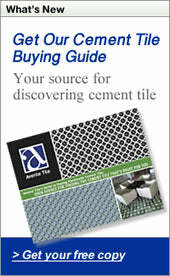 I hope all of your customers take the time to really investigate which Avente tile will work best for their application. As much as we all want to finish a project in a timely manner and to rein in our spending, for me, it was well worth the wait and additional expense to ensure I determined precisely what we wanted in our space. And given that I had the original sample tiles, I was confident in my recognition that there was a color/execution mistake in the first order. Of course, you were brilliant in working through this issue with us, and we are most appreciative for your help. TT: What sealer did you use and where did you get it? Initially we bought three pints of penetrating sealer in December from Richard James Specialty Chemicals Corp. in New York. It was their Stonelok™ "MLT-Plus" water-bourne sealer for concrete in a matte finish, and I ordered the product directly from the company. TT: I remember you called me to discuss streaking that occurred after the sealer was applied. How did you resolve that problem? With sanding or another sealer? Unfortunately the application of the sealer may have been our biggest headache. We tested the sealer on a cement sample and realized that it was streaking with typical application. So I contacted Katrine from Richard James for help. She advised that the thinner the application, the better with this particular sealer. With that we experimented some more and found that we could lightly spray the sealer on the tile and then spread it out evenly with a foam brush. But several things went wrong. First, applying sealer to a wall as opposed to a floor requires a lot more care to ensure there are no streaks or drips. To that end, I called Katrine to tell her that I did not like the application, and she overnighted a pint of their newest sealer (they did not have this one in December) that she believed would be more forgiving on the tile. This one is called TK6 NanoCoat in XTRA low gloss, and it comes as a single component, so the pot life of the product is not an issue like the MLT-Plus. Also, Rako did not anticipate the bounce-back from the spray and we ended up with sealer sprayed all over the zinc countertops and appliances, and the blue tape stuck to the countertop in places where the sealant dripped. When I realized all of this the next morning, I immediately called Katrine yet again to see what she would recommend to remove the sealant before it fully cured. (I also spoke with you as well as the folks at Copperworks.) To remove the sealer (and blue tape), I had to work in patches with ammonia, a soft toothbrush, and a plastic scraper. It took forever! Then I had to hand sand each tile to remove as much of the MLT-Plus streaks/drips as possible and then clean the tiles with a sponge. After that preparation (boy, were my arms buff and shoulders sore! ), I thinly applied several coats of the new TK6 NanoCoat in sections with foam brushes. I still had to be very careful with some streaking or dripping if there was too much material on the tile, and to this day, there are still two tiles on the wall that bug me because I can see a crisscross pattern from my application of the sealant. The good news is, that overall, the tiles finally looked like the smooth yummy tiles that made me fall in love. TT: What was the most discouraging moment during the project? The sealing experience was definitely the most discouraging moment. We finally had these beautiful tiles installed and then their surface was ruined by the application of a penetrating sealer. I was totally depressed. Though, by the end, I felt like I had made love to each and every tile on the wall; I know them intimately now! I would recommend the TK6 NanoCoat, and if you are doing a wall application, I would recommend PRACTICING on several tiles that are standing upright (even stack some end to end) so you can really get the feel of how the sealer needs to be applied. It may sound like a waste of tile and sealant, but I think it may save you much heartache should the initial application not go well. I also wonder (especially if I had the time and space to do so) if there is any benefit to sealing the tiles with one coat prior to application if you are using tiles on a wall. Doing this is not necessary as a grout release with the Avente tiles and the grout that we used, but perhaps that could help the second coat of sealant go on more smoothly and evenly once the tile is on the wall and grouted. I don't know. TT: What was the most exciting? It was pretty darn exciting to see the tile up on the walls! There were many folks who were concerned that these thick cement tiles would not work on a wall, and I am so grateful that they were wrong. I was also worried how well the polk gold edging tiles would work, but I absolutely love how the solid trim works with the Romana tile and on the odd wall indention. Rako did a fabulous job designing and cutting the bullnose tiles to match the details of the space; the polk gold both frames the Romana pattern and gives some added dimension beside that high wall of tile. Given that the Romana tile was the one element that pulled together all of our design choices, it was ironic that it was the very last thing to be installed and so wonderful to see our vision finally fulfilled in its entirety. TT: Knowing what you know now, would you do it all over again? Or, have you decided to become a Kitchen & Bath designer? Haha! As a theatre artist, producer, scholar, and educator, perhaps it would be more profitable for me to switch my profession, but alas, I'm not sure I could design for others. This project was just so driven by our specific needs and tastes. I do know I can execute a project for others, and, in fact, soon I will be helping my niece renovate her kitchen here in NYC. In all sincerity, every day we realize small surprises about our new kitchen that thrill us. I never realized how helpful it is to have a really deep sink, for example, or how much we love our pull-out trash cans under the sink. Also, not only are we incredibly fond of our zinc countertops, we adore having additional counter space, especially when we have a dinner party. We honestly love the view of our kitchen from our living room; all of the textures, colors, and elements are cheerful and the cement tile wall is really a piece of art. As soon as we hit a windfall, we'll move on to renovating our tiny New York bathroom with more Avente tile - !! Thank you, Bill. You're a complete dream to work with, and Marc and I look forward to sharing cocktails with you here in New York at our apartment - ! A job well done. Constance, I congratulate you and Marc! Your project is an example of what tenacity and hard work can achieve. It also shows how great design is achieved when your style is the guide. And finally, my hat is off to your construction team - they executed your design with elan! May you continue to find happiness in your kitchen, with each other and in your lives! 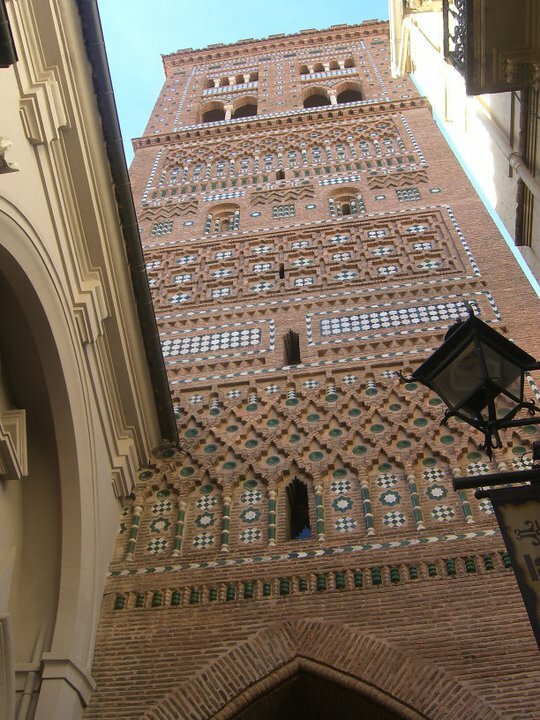 In my last blog post, Spanish Tile as a Building Material, Part 1, I wrote about the extensive use of ceramic tile as an architectural and sustainable necessity in the city of Zaragoza, the capital of the region of Aragon. In Part 2 of this three-part series, my focus will be on Teruel (a World Heritage site as designated by UNESCO). 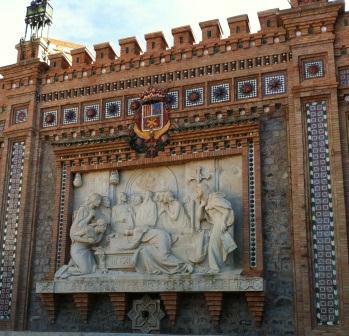 The entrance to the fortress-like city of Teruel features a depiction of the young lovers Juan Diego de Marcilla and Isabel de Segura Teruel. 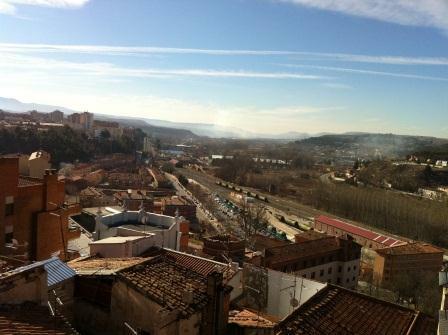 As an admirer of all things tile, and as one who is accustomed to looking down at floors, this visit to Teruel had my attention happily transfixed upon this city's well-preserved walls and massive towers. As a center for Mudejar art, a style influenced by Islamic tradition and more contemporary European architectural styles, the fortress-like city is characterized by its extensive use of brick and ceramic tile not only within the centuries-old structures, but also on their façades. 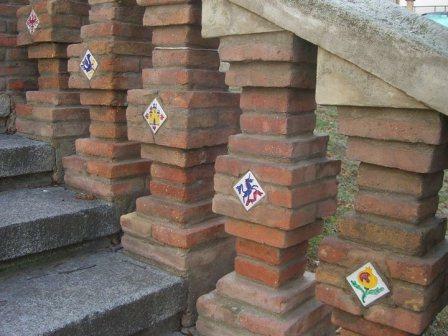 This brick and ceramic tile staircase leads to the city of Teruel. According to UNESCO, the Mudejar art in the Aragon region developed as a result of the Christian Reconquest in the early 12th century. Following a series of campaigns to recapture territory from the Moors, such as in Spain and Portugal, Christians of the region allowed the Moors to remain on the reconquered territories, going so far as to allowing the Moors to keep their own culture and religion, most importantly, their expression of art. 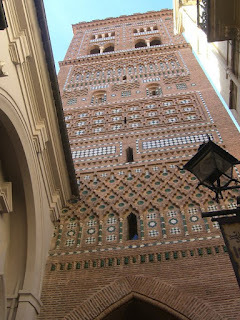 Because of the symbiotic relationship between Gothic style and Muslim influences, Mudejar art and architecture flourished in the Teruel region, as can be seen in this picturesque city’s churches and cathedrals, most notably the cathedral tower (1257), the tower of the church of La Merced (late 16th century), the tower of San Martin (1315), the tower of the church of San Pedro (14th century), and the tower of the church of El Salvador (12th-13th centuries). Further examples of the importance of glazed ceramic tile products as a building material are not only evident on these graceful towers, but also throughout this enchanting historical city. The tower of El Salvador features multiple levels of white and green ceramic tiles. The breath-taking view from the top of El Salvador’s tower. The twin tower of San Martin, El Salvador, dates from the beginning of the 14th century, although it was rebuilt in 1677 after it collapsed. The tower has several levels bordered with tiling in rhomboid patterns, borders and semi-circular arches, decorated with white and green tiles. 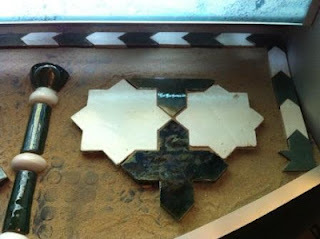 Here's an up-close look at the various shapes and sizes of the white and green ceramic tiles used throughout the city of Teruel. In my next post, I’ll take you on a journey to Valencia, where Cevisama, (the International Ceramic Tile and Bath Furnishings Show) is held annually. 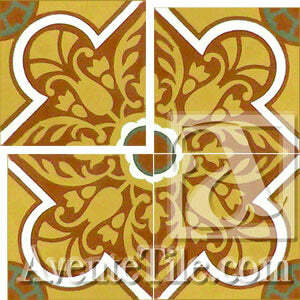 In the meantime, you can check out the beautiful hand-painted ceramic Spanish tiles offered by Avente Tile.